Soooo many sales on DNA test kits for genealogy now. Black Friday sales and low prices throughut the holiday season. Now is the time to test or order an upgrade. 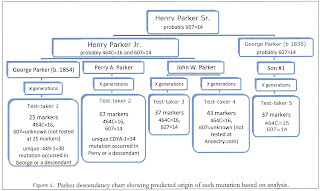 This is the testing company primarily used by members of the Texas State Genealogical Society's Early Texans DNA Project (see http://www.txsgs.org/programs/dna-project/early-texans/ for more info). 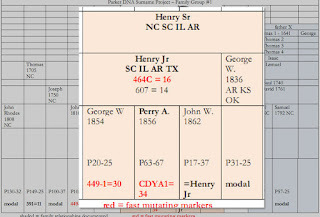 Parker Y-DNA Surname Project and Parker FamGroup1 Family Finder Project are also at Family Tree DNA. Black Friday Sale (ends 27 November 2017 at 11:59 PST) - Family Finder (autosomal DNA test) only $49 USD and standard shipping $4.95 USD per kit. After that time the kit price goes up to $59 with standard shipping, but that price is still a great deal! If you have tested elsewhere you can upload the data to Family Tree DNA for free and pay only $19 for access to premium analysis tools. Family Tree DNA customers also receive holiday coupons by logging in to your account and clicking on the "Holiday Reward" button. Each week a new coupon is offered. Many customers are sharing coupons they do not need on Facebook, mail lists, and in a shared Google Docs file at https://docs.google.com/spreadsheets/d/1CgXRKz2TySvRqSInveSIYoslO7yexAc9d-BzpNhaY1c/edit#gid=1193411620. $49 DNA Kit 21 November to 27 November (Normal price is $99). Free expedited shipping on orders of three or more kits (US only) and free standard shipping on two or more kits. MyHeritage also accepts free raw data uploads from other companies. Ancestry-only kits are $69 and Ancestry + Health is $149 through 26 November at 23andMe. $89 Black Friday sale price. Sale price of $159 after Black Friday. $199 normal price kit. 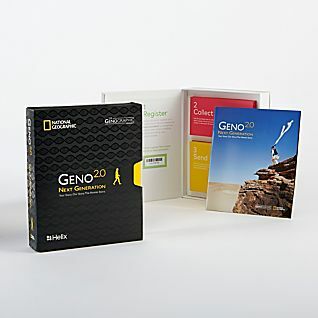 Black Friday sale price $69 at https://shop.nationalgeographic.com/category/geno-dna?code=SR90002&gclid=EAIaIQobChMI77Pu4cLX1wIVDrXACh28EAomEAAYASAAEgICVfD_BwE (normally $199). Disclaimer: I receive no compensation from any of these companies. I am a satisfied paying customer of all the companies included. To cite this blog post: Debbie Parker Wayne, "DNA Test Kit Sales," Deb's Delvings, 24 November 2017 (http://debsdelvings.blogspot.com/ : accessed [date]). 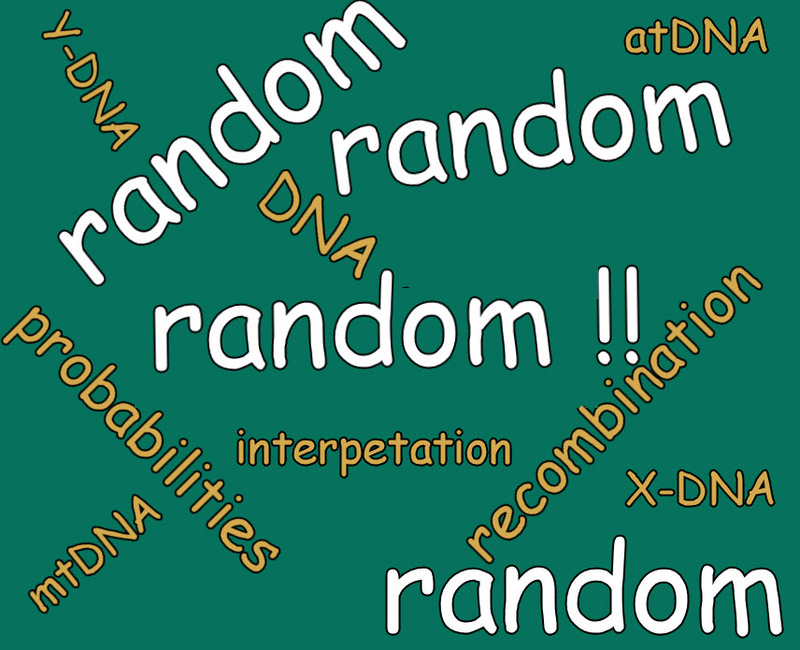 My blog post on "DNA Analysis: Random is Most Important Factor" generated a discussion that resulted in some questions on where to find more about probability and the algorithms companies are using when analyzing our DNA data. I have been working to update and merge my online DNA bibliography and the bibliography I provide to students attending the DNA courses at institutes, but it is still a work in progress. The following list is far from comprehensive, but lists some selected resources that provide useful information. I tried to find public links for all of these, but some may require you to login to the website to access the papers. All URLs were accessed 10 October 2017. Whenever I want to learn more about any topic related to genetic genealogy, I check the following sources first. These are all currently active and written by experienced genetic genealogists who also have scientific or engineering backgrounds. 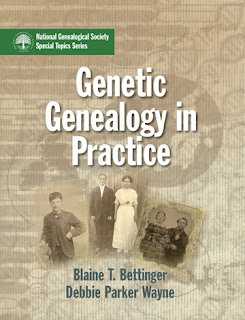 Blaine T. Bettinger, The Genetic Genealogist (http://www.thegeneticgenealogist.com/). Leah Larkin, The DNA Geek (http://thednageek.com/). Roberta Estes, DNAeXplained - Genetic Genealogy (http://dna-explained.com/). Dan Morris, Bayes' Theorem Examples: A Visual Introduction For Beginners, Independently published, 2016 (https://www.amazon.com/Bayes-Theorem-Examples-Introduction-Beginners/dp/1549761749/). Newer editions of these are available. I wanted it for the basics of biology and genetics so this older version covered everything I needed and was more economical. Robert J. Brooker and Johnny El-Rady, Student Study Guide / Solutions Manual to accompany Genetics: Analysis & Principles 4th ed. (New York: McGraw Hill, 2012; not available on Amazon when I checked recently). Eric Y. Durand, et al., "Ancestry Composition: A Novel, Efficient Pipeline for Ancestry Deconvolution," White Paper 23-16, 23andMe (https://permalinks.23andme.com/pdf/23-16_ancestry_composition.pdf). C. B. 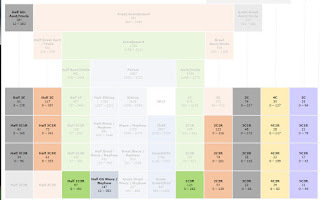 Do, et al., "A scalable pipeline for local ancestry inference using thousands of reference individuals," 23andMe, Poster (http://blog.23andme.com/wp-content/uploads/2012/11/20121027_ancestry_painting_methods_poster.pdf). "Relatives In Common Tool," 23andMe, Customer care (https://customercare.23andme.com/hc/en-us/articles/221689668-Relatives-In-Common-Tool). Catherine A. Ball, et al., "Ethnicity Estimate White Paper," AncestryDNA (https://www.ancestry.com/dna/resource/whitePaper/AncestryDNA-Ethnicity-White-Paper). Catherine A. 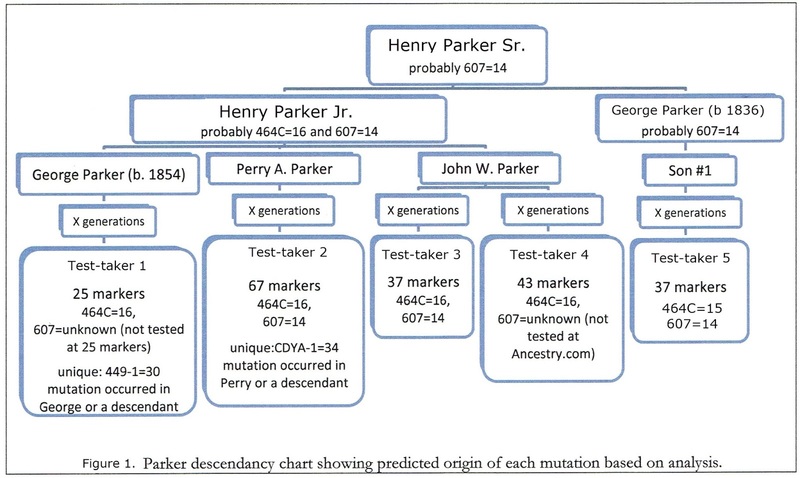 Ball, et al., "AncestryDNA Matching White Paper," AncestryDNA (https://www.ancestry.com/dna/resource/whitePaper/AncestryDNA-Matching-White-Paper). Anna Swayne, "Behind The New AncestryDNA Feature: Amount of Shared DNA," AncestryDNA (http://blogs.ancestry.com/techroots/behind-the-new-ancestrydna-feature-amount-of-shared-dna/). Anna Swayne, "DNA Matching Just Got Better," AncestryDNA (http://blogs.ancestry.com/ancestry/2014/11/19/dna-matching-just-got-better/). Catherine A. Ball, et al., "Genetic Communities™ White Paper: Predicting fine-scale ancestral origins from the genetic sharing patterns among millions of individuals," AncestryDNA (http://www.ancestry.com/cs/dna-help/communities/whitepaper). Catherine A. 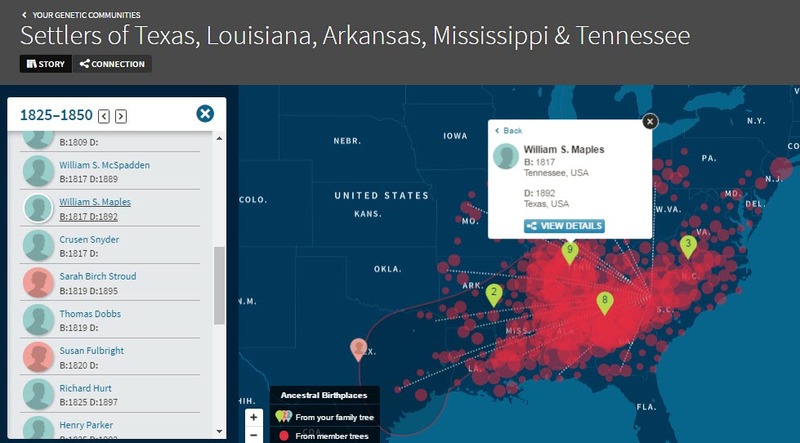 Ball, et al., "DNA Circles White Paper," AncestryDNA (https://www.ancestry.com/dna/resource/whitePaper/AncestryDNA-DNA-Circles-White-Paper). Julie Granka, "The Science Behind New Ancestor Discoveries, AncestryDNA Blog, 2 April 2015 (https://blogs.ancestry.com/ancestry/2015/4/2/the-science-behind-new-ancestor-discoveries/). Anna Swayne, "Exploring Your DNA Circles," AncestryDNA (http://c.ancestry.com/cs/media/exploring-your-dna-circles.pdf). Razib Khan, "MyOrigins Methodology White Paper," The Family Tree DNA Learning Center BETA (https://www.familytreedna.com/learn/user-guide/family-finder-myftdna/myorigins-methodology/). 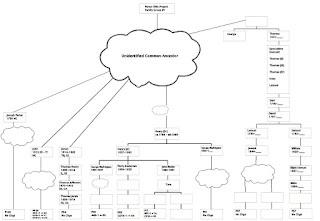 "Family Finder – Family Matching System," The Family Tree DNA Learning Center BETA (https://www.familytreedna.com/learn/ftdna/ftdna-family-matching-system/). "How much genetic sharing is needed for two people to be considered a Family Finder match?," The Family Tree DNA Learning Center BETA (https://www.familytreedna.com/learn/autosomal-ancestry/universal-dna-matching/genetic-sharing-considered-match/). Blaine Bettinger, "Family Tree DNA Updates Matching Thresholds," The Genetic Genealogist, 24 May 2016 (https://thegeneticgenealogist.com/2016/05/24/family-tree-dna-updates-matching-thresholds/). 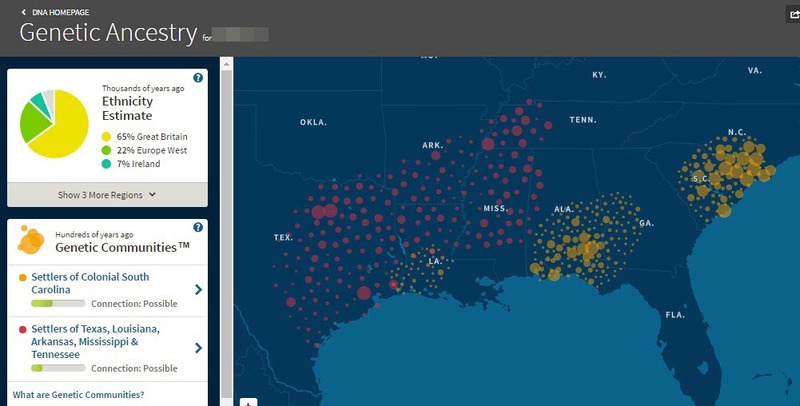 Esther, "Introducing Our New DNA Ethnicity Analysis," MyHeritage Blog, 1 June 2017 (https://blog.myheritage.com/2017/06/introducing-our-new-dna-ethnicity-analysis/). Esther, "DNA Matching Enhanced with New Features," MyHeritage Blog, 17 January 2017 (https://blog.myheritage.com/2017/01/dna-matching-enhanced-with-new-features/). Esther, "Introducing the DNA Match Review Page," MyHeritage Blog, 22 August 2017 (https://blog.myheritage.com/2017/08/new-review-match-page-discover-how-you-are-related-to-your-dna-matches/). Leah Larkin, "MyHeritage Matching," The DNA Geek, 21 July 2017 (http://thednageek.com/myheritage-matching/). 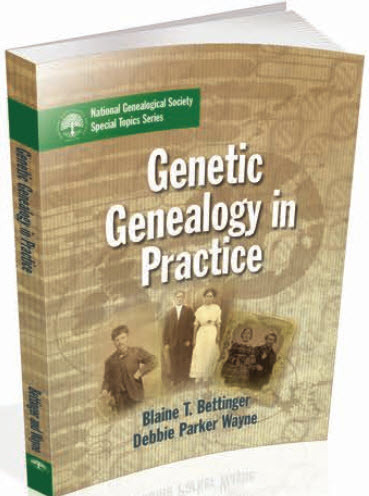 Blaine T. Bettinger and Debbie Parker Wayne, Genetic Genealogy In Practice, published in September 2016 by the National Genealogical Society (NGS). To order the print version, click here, then click the cover image on the displayed page or go directly to the online store. Price is $30.06 for NGS members, $36.05 for non-members. The print version is best for working the exercises. For the Kindle version ($9.99), click here. Note: As an author I receive royalties on sold copies of Genetic Genealogy In Practice. I receive no incentives from any other entities named in this post. 11 October 2017: Corrected spelling of the name of one author. To cite this blog post: Debbie Parker Wayne, "Selected References for Math, Biology, and DNA Testing Company Algorithms and Features," Deb's Delvings, 10 October 2017 (http://debsdelvings.blogspot.com/ : accessed [date]). 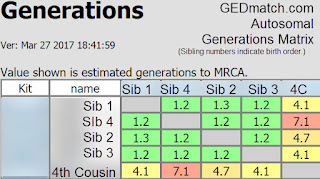 Correctly analyzing DNA matches for genetic genealogy is much harder than most researchers may think. What is the most important thing to remember when interpreting DNA matches to determine relationships? Researchers must remember that random recombination and mutations make it impossible to predict exactly how much DNA, if any, will be shared by two people, in general. The charts giving shared percentages of 50%, 25%, 12.5%, and so on are based on statistical probabilities. Real life seldom ever exactly matches a statistical probability. One exception is that each person does inherit one-half of the autosomal DNA from each parent. Any reader of a mail list, forum, or Facebook will constantly see questions such as, "I share XYZ% of DNA with personXYZ. What relationship do we share?" And that reader will see tons of responses such as, "You must be XYZ relationship." The more savvy researchers will indicate there are several likely relationships and point to charts such as The Shared cM Project.1 There are also some tools, such as the matrices on GEDmatch.com and the relationship predictions made by the testing companies, that use the statistical shared percentages to predict relationships. Researchers must remember to use these predictions only as clues and not as a hard-and-fast limit to accurately analyze DNA findings. Blaine published "The Shared cM Project" data using a Creative Commons License which gives permission for others to use and adapt the data as long as the adaptation is also made freely available and follows a few other restrictions. 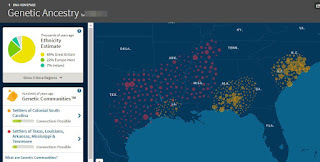 Jonny Perl at DNA Painter adapted the data to create a Shared cM Project tool that highlights relationships that have been shown to share a specified amount of DNA. There are some differences in the highlighted relationships for 12.4 and 52.1 shared cM as shown in the images below. 1. Blaine T. Bettinger, "The Shared cM Project," The Genetic Genealogist (https://thegeneticgenealogist.com/). Search the blog posts for the most recent update to the project. 2. Genetic Genealogy Standards Committee, Genetic Genealogy Standards(http://www.geneticgenealogystandards.com/). 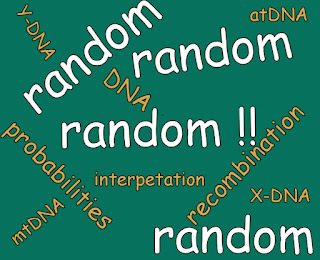 To cite this blog post: Debbie Parker Wayne, "DNA Analysis: Random is Most Important Factor," Deb's Delvings, 9 October 2017 (http://debsdelvings.blogspot.com/ : accessed [date]). 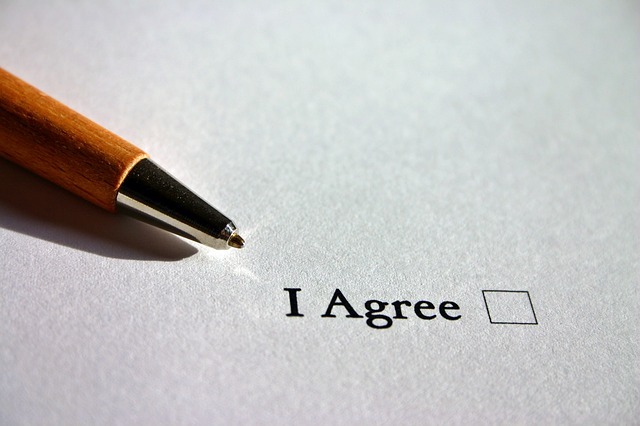 Over the years there have been several discussions about sample consent forms a genealogist might use when asking a person to take a DNA test. Recently, Blaine T. Bettinger, The Genetic Genealogist, posted a sample beneficiary form on a Facebook group. Blaine's example and several others are linked from the ISOGG Wiki page on "Project consent forms." Blaine's form is specifically written to name a beneficiary to manage a DNA sample after the death of a DNA donor. Because Blaine assigned a Creative Commons Attribution 4.0 International License, others have permission to share and adapt the document. I have made two adaptations of Blaine's document. The first adaptation is for use with my family members who take a DNA test: naming me as beneficiary to manage the kit after death of the test-taker, indicating preferences for sharing the information, whether a legal name or an alias should be used when sharing, ensuring the test-taker knows about the Genetic Genealogy Standards, and that I cannot ensure anonymity no matter how hard I work to do so. Blaine included space for a notary public to witness the signing of the document which would definitely give the document more standing if legal proceedings are ever involved. Most of the time when I am getting a sample from a family member we will not be able to easily access a notary. I changed this section to have two others present sign as witnesses; this is a more viable situation for most of us on a day-to-day basis. 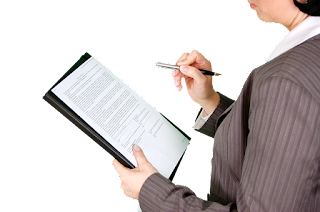 You will have to decide if you want a notarized document or if witnesses are an acceptable alternative if you want to do something similar. The second adaptation is for a project member indicating the same preferences and giving me permission to analyze their DNA test results, but not naming me as a beneficiary. No witnesses are requested for this document as I expect it will normally be provided to me through electronic means and I will not be present when the test-taker signs it. Feel free to take these and adapt them further for your use. PDF and Word 2010 versions of both documents are available on my website Quick Reference Links. To cite this blog post: Debbie Parker Wayne, "DNA Analysis Consent Forms," Deb's Delvings, 28 September 2017 (http://debsdelvings.blogspot.com/ : accessed [date]). Updated 5 October 2017: Much appreciation goes to Family Tree DNA and its customers who ordered kits in September. This banner on the website shows over thirty-five thousand dollars are being donated to help the victims of Hurricane Harvey. Thank you all. There are still two weeks during which you can help yourself and others at the same time. Family Tree DNA is located in Houston, Texas, where many have lost homes, jobs, and everything they owned due to floods caused by Hurricane Harvey and the release of waters from the local reservoirs. For all sales and upgrades of DNA tests and paid data transfers made in September, Family Tree DNA is donating a portion of the proceeds toward Hurricane Harvey relief efforts. The banner on their home page today shows $14,882 has been collected so far. That is almost $1,000 per day! Please consider ordering more DNA tests from Family Tree DNA before the end of September if you can do so. You win and you help the thousands and thousands of people who have been devastated by this disaster. To cite this blog post: Debbie Parker Wayne, "Further Your DNA Research and Help Hurricane Harvey Victims at the Same Time," Deb's Delvings, 16 September 2017 (http://debsdelvings.blogspot.com/ : accessed [date]). I have been invited to teach an all-day DNA seminar in a workshop format in Germantown, Tennessee, on 28 October 2017. This will include hands-on analysis of autosomal DNA segments and correlating the DNA and documentary evidence. The original event space in Germantown sold out, but there are spaces available in the larger venue now reserved. This will be my last workshop this year (my other scheduled events have been cancelled due to damage caused by Hurricanes Harvey and Irma). I am looking forward to spending time in Germantown, Memphis, and southwest Tennessee. I hope to see many old friends there and make some new friends. Registration is available at http://www.tngs.org/event-2556801. A family tree and documents will be used for hands-on activities to confirm (or refute) links in a tree, determine if a newly found DNA match belongs in the same tree, and whether documentary evidence correlates with the DNA evidence to support or disprove a hypothesis. To cite this blog post: Debbie Parker Wayne, "DNA Workshop, Southwest Tennessee, 28 October 2017," Deb's Delvings, 16 September 2017 (http://debsdelvings.blogspot.com/ : accessed [date]). Genetic Genealogy, using DNA to answer genealogical questions, is one of the hottest topics in genealogy today. Every professional researcher, really every researcher of any kind, needs a basic understanding of using the different DNA tests available, analysis tools, and writing about DNA analysis to incorporate it into research reports or essays. Researchers must understand how to correlate DNA evidence with documentary evidence to analyze a genealogical question, and they also must understand how to present DNA evidence in a format understandable by novices as one of the elements supporting a conclusion. A hands-on workshop helps understand the necessary skills. 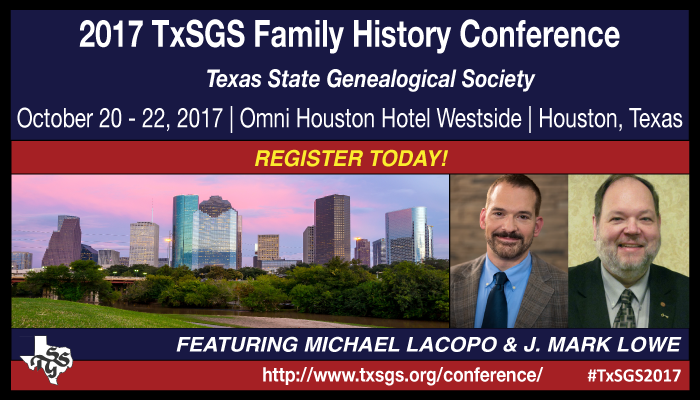 Lone Star Chapter of APG is sponsoring a four-hour Autosomal (atDNA) Analysis Workshop at the upcoming 2017 TxSGS Family History Conference. Attendance will be free to all Lone Star Chapter of APG members. Non-members of the chapter must pay a registration fee ($50) to attend this limited-space workshop. The workshop will be on Saturday afternoon, 21 October 2017. The current schedule lists a 1:30pm start time, but the start time may change to 1:00pm. Check your conference schedule once you arrive. This workshop is for researchers with high-beginner to intermediate level DNA knowledge and professional genealogists adding DNA clients. Topics covered in the workshop include a brief review of DNA inheritance and analysis tools for the match list, family trees, and DNA test results. A case study will illustrate DNA analysis, applying documentary and genetic evidence, and writing and reporting the results. Lone Star Chapter members, or those who wish to renew or join the chapter to get this member benefit, should contact Treasurer Michael Belcher at mikeandvickib@mac.com. Michael can supply you with the code to enter during conference registration to get free registration for this four-hour workshop and he can assist with joining the chapter if you are not already a member. You must first be an APG member before joining the Lone Star Chapter. 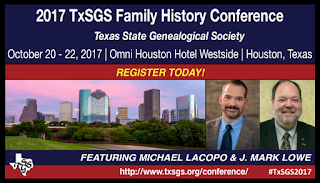 Conference and workshop registration is through the TxSGS website at http://www.txsgs.org/conference/registration/. Do not forget to enter the workshop code (obtained from Michael Belcher) or you will be charged for the workshop registration. This workshop is presented by me. For those who may not know my background, I am co-author (with Blaine T. Bettinger) of the popular, first-ever genetic genealogy workbook, Genetic Genealogy in Practice, published by the National Genealogical Society (NGS); author of the online, self-paced course Continuing Genealogical Studies: Autosomal DNA, offered by NGS; coordinator of the first DNA courses presented at all four of the major genealogy institutes (GRIP, SLIG, IGHR, CAFG FGI); and the DNA Project Chair for the Texas State Genealogical Society and the Early Texans DNA Project. Other publications include a column on using DNA analysis for genealogical research in NGS Magazine from 2013 to the present, many DNA articles in TxSGS journal Stirpes, articles in the APG Quarterly, and other regional journals. More information and archived versions of many of these articles can be found at http://debbiewayne.com/pubs.php. The Texas State conference is one of the biggest annual conferences in the area with many fine speakers known nationally, regionally, and locally. Check out all of the other informative sessions available from conference headliners J. Mark Lowe, CG, and Dr. Michael Lacopo as well as the many sessions presented by Deborah A. Abbott, PhD; Susan Ball; Andrew Carroll; Henrietta Martinez Christmas; Deena Coutant; Schelly Talalay Dardashti; Patti Todd Gillespie; Sara Gredler; Colleen (Robledo) Greene; Tony Hanson; Susan Kaufman; Andrew Lee; Devon Noel Lee; Janice Lovelace; Bernard Meisner; Kelvin L. Meyers; Betsy Mills; Jeannette Piecznski; Diane Richard; Mary Kircher Roddy; Michael L. Strauss, AG; Cari Taplin, CG; Lisa Toth Salinas; Angela Walton-Raji; and Eric Wells. We hope to see you all there at this must-see event in Texas, 20–22 October 2017 in Katy (just west of Houston). The ICAPGenSM service mark and the Accredited Genealogist® and AG® registered marks are the sole property of the International Commission for the Accreditation of Professional Genealogists. All Rights Reserved. In celebration of our recent milestone—surpassing 8 billion historical records on SuperSearch—we’re happy to announce that we’re making all of our major census collections from the U.S., U.K. and Ireland, Canada, and Nordic countries free for everybody, for one week! Starting on Monday, August 14, until August 20, no Data subscription will be required to access these documents, and you can search through this treasure trove of census records for free. That’s 94 collections, containing over 1 billion census records! Some of the census records are found exclusively on MyHeritage. This is available to users of MyHeritage as well as people who have never used MyHeritage before. 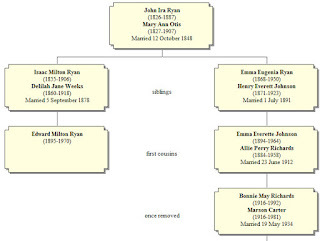 With our earliest census records dating as far back as 1657, and the latest ones extending until 1940, these records are an excellent way to learn more about the lives of your ancestors and to add details to your family tree. 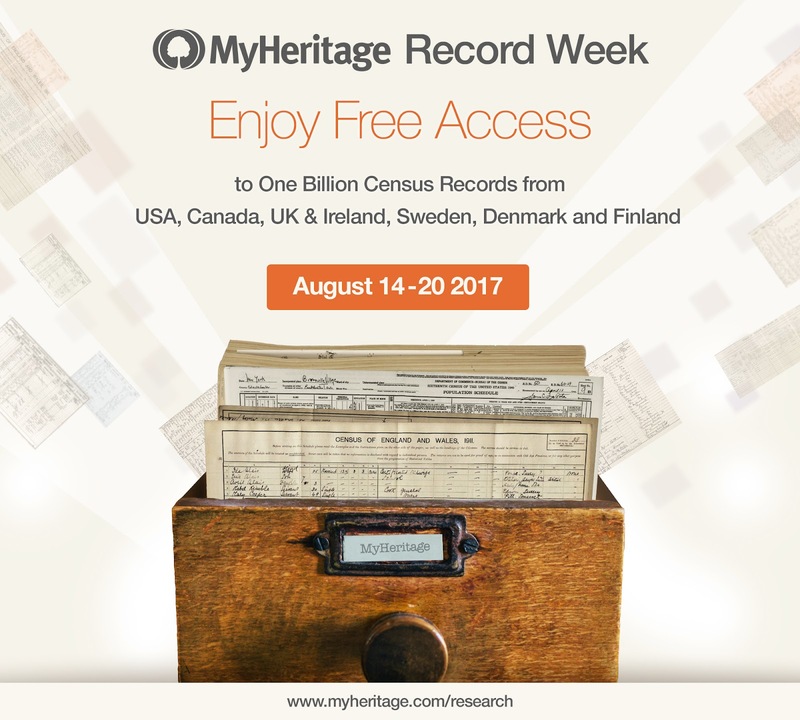 Take advantage of this fabulous offer to see what MyHeritage offers that differs from other subscription census sites and to take a look at those census records in non-USA countries that you may not have access to on other subscription sites. Thank you, MyHeritage. I have no affiliation with MyHeritage except as a paying customer. 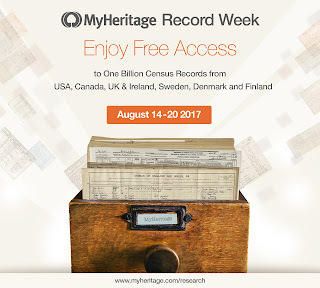 To cite this blog post: Debbie Parker Wayne, "Free Access Week: All Censuses on MyHeritage," Deb's Delvings, 14 August 2017 (http://debsdelvings.blogspot.com/ : accessed [date]). This is a small tip but a great time and frustration saver for anyone who has tested a lot of family members at Family Tree DNA or who uses aliases instead of real names for test-takers at any DNA testing company. This tip helps me import data into the correct Genome Mate Pro profile. It also helps me ensure that I am analyzing the correct person's data when I am using other tools such as Double Match Triangulator by Louis Kesslerr or David Pike's atDNA Tools. Before I started using this method I had to keep a cheat sheet handy correlating DNA kit numbers with the alias name on the account and the real name of the test-taker. 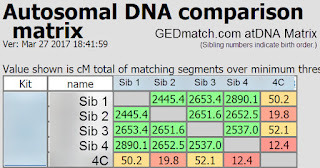 In order to keep up with new DNA matches we must periodically download the new match list and associated data. 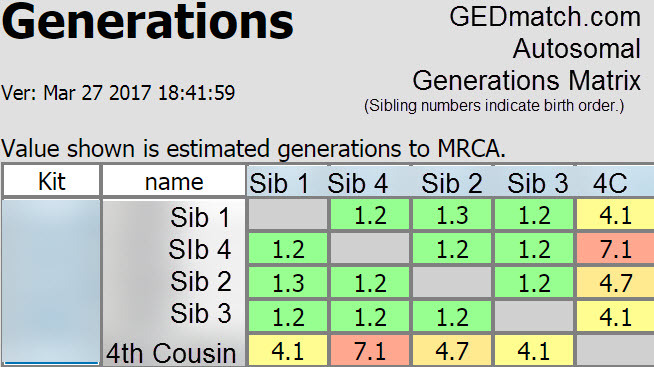 For Family Tree DNA I use the DNAgedcom Client to download match lists, chromosome segment comparisons, and In Common With (ICW) data. Downloaded DNA results for from FTDNA include the kit number and content description, as in 12345_Family_Finder_Matches.csv, 12345_ChromosomeBrowser.csv, and 12345_ICW.csv (where 12345 is the kit number). When you have all three files for twenty or more family members it can be difficult to find the files for one family member unless you keep a cross reference for kit number and name. 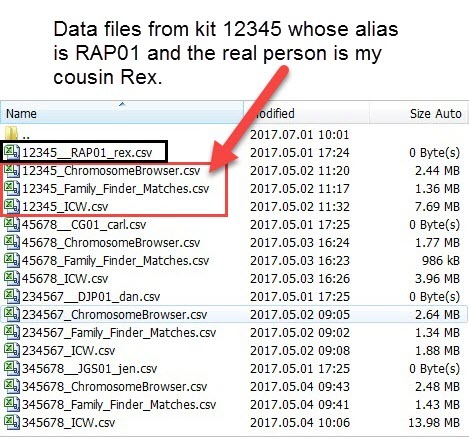 For those of us with dozens of family members tested, I came up with a trick to save time in identifying downloaded results and which family member they belong to. I no longer have to keep my cross reference list handy. I made a folder where I have one empty file for each family member. The file name is what is important, not the contents. 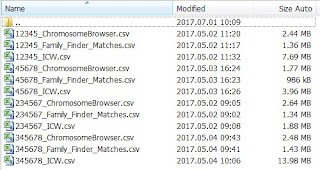 The file is named 12345__ALIAS_realname.csv (where 12345 is the kit number, ALIAS is the account name for the kit, and realname is the name I know that person by). Any time I download DNA test results to a new folder I can copy my empty files into the download folder. 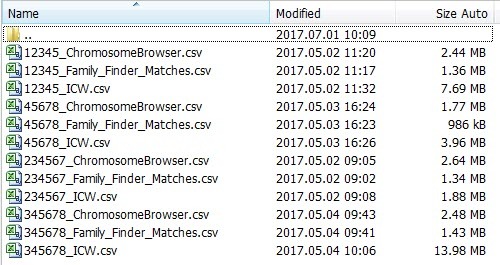 The file names sort so that my empty file identifying the person associated with a kit number allows me to easily identify whose data files I am looking at. These screenshots are from one of my favorite programs, FreeCommander, a great Windows file manager replacement with many features that I love. I use FreeCommander much more than I use Windows Explorer. 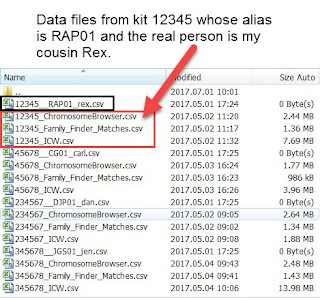 Debbie Parker Wayne, "DNA Data Org Tip: Associate Kit with Name for Downloaded Data," Deb's Delvings, 1 July 2017 (http://debsdelvings.blogspot.com/ : accessed [date]). I have no interest in any of the companies or tools mentioned here except as a satisfied user and/or customer. Edited 13 July 2017 to add MS Word Smart Art tip from David Williams. I presented a webinar last month on correlating DNA and documentary evidence using the Genealogical Proof Standard (GPS). The webinar was sponsored by BCG and presented by Legacy Family Tree Webinars. Several viewers contacted me asking how I created the charts I used in the webinar. Over the last few years I have tried multiple methods. I wrote about some different methods I have used and asked researchers to send me your feature wish list back in March ("Wanted: Genetic Genealogy Analysis Tools Incorporating Family Tree Charts"). I am still collecting ideas for all types of features genetic genealogists would like added to software programs to assist in DNA analysis. Please email your wish list to debbieparkerwayne at gmail dot com or add a comment to this blog post or the "Wanted ..." blog post. 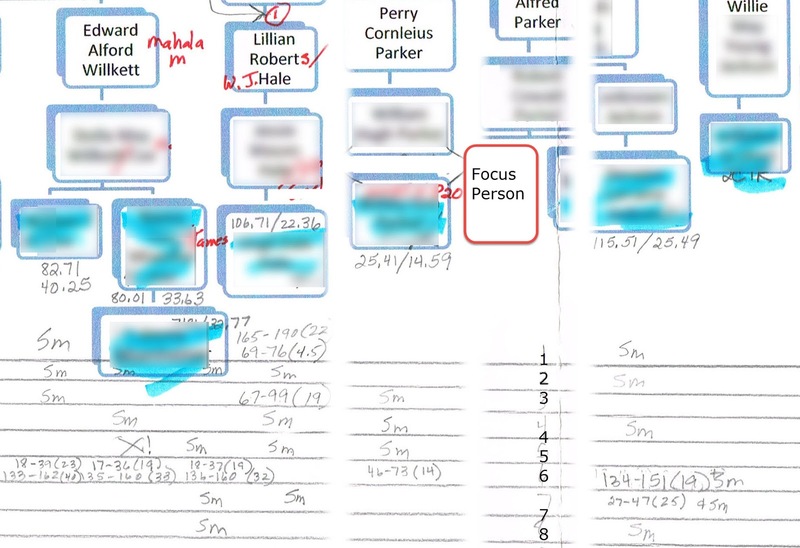 The family tree charts in the webinar were made with Smart Art in Microsoft (MS) Word where I customized the colors and effects on the boxes. A template for the charts is online at http://debbiewayne.com/presentations/dna/MSWord_smartart_chart_black.docx. 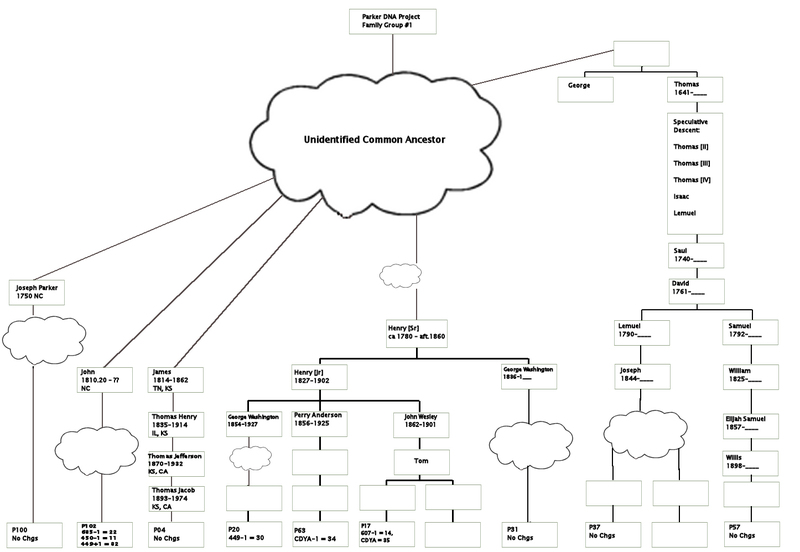 I sometimes use TreeDraw (http://treedraw.spansoft.org/), Progeny Charting Companion (https://progenygenealogy.com/products/family-tree-charts.aspx), and RootsMagic, as well as Microsoft Smart Art to create the charts. Lucid Chart (https://www.lucidchart.com/) is used by some of my colleagues. It has some features you have to pay to access and it is a web-based tool. Until one of the genealogy or charting programs or third-party utilities automates the process I have settled on the following procedure to create my charts for DNA analysis. 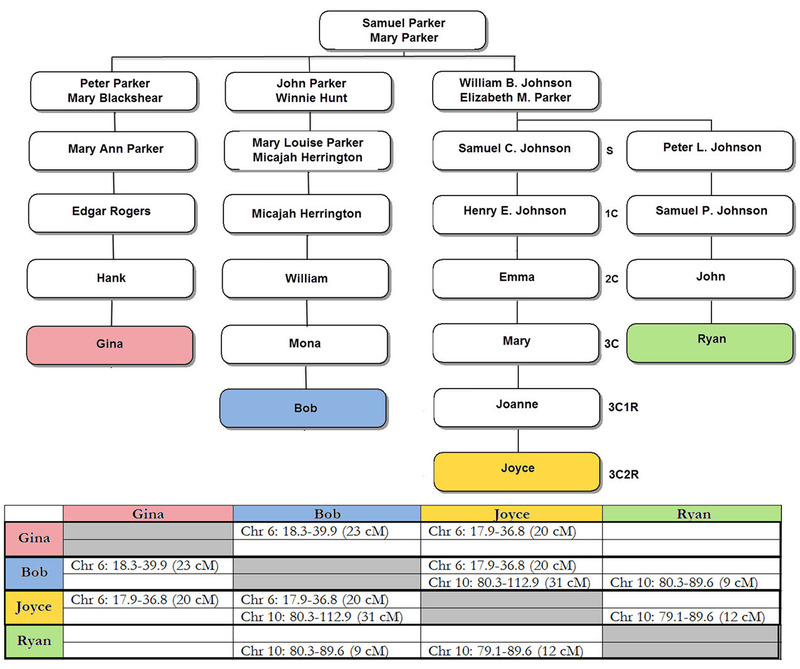 I create a descendant chart (using one of the tools named above) with only the lineages of the DNA test-takers under analysis. When using MS Smart Art I add one extra block at the bottom of each line because, for some silly reason, Word offsets the last block. Tip from David Williams added 13 July 2017: Instead of adding an extra block, click on the "Design" ribbon, click on the parent block for the offset block, click on "Layout" in the "Create Graphic" section of the ribbon, select "Standard." This relocates the last block in a straight line with the others. Thanks, David, for sharing this Word tip. I found you can also use control/click to select all of the parent blocks before clicking "Layout> Standard" and fix all lines at one time. Also, if you do not see the "Layout" drop-down menu in the "Create Graphics" section of the ribbon, it may be because Word replaces the words with icons when the window is too narrow to display all of the words spelled out. Make your Word window wider or move your mouse over the image of a chart in the "Create Graphics" section and then you should see a popup indicating this is the link to "Organizational Chart Layout." The template has been modified to fix this layout issue. There is no need to add an additional block any longer. Once I have the chart I want, I grab a screen-shot and save it as an image. I use Snagit by TechSmith, but there are other options including built-in operating system snipping tools. I then insert that chart image into my image editor (I use Snagit editor) (where I used to remove that offset block, but no longer need to now). I may also fill in background colors or make other changes to the image, sometimes coloring in the block for my focus person. I insert the modified image into a Word document and enlarge it to fill the page leaving a margin on both left and right. I create a MS Word table under the image. The table has two columns more than the number of lines in my descendant chart. I then either manually size each table column or use the table properties to have Word automatically size the columns so that each table column lines up under a family line in my chart. The two extra columns are to the left and right. I insert the names of the test-takers into the left column, right column, and the top row of the table so I have a matrix to indicate how all of the test-takers compare to each other. or whatever is being analyzed. Once I am satisfied with my numbers then I enter them into the table in Word and save the document. For detailed analysis, I use the full chromosome segment start and end values as given by the testing company. In the webinar and the images above I shortened the numbers by using K to represent thousands and M to represent millions. This is to allow more data to fit onto the image for a Powerpoint slide. The process is more complex to describe than it is to do. 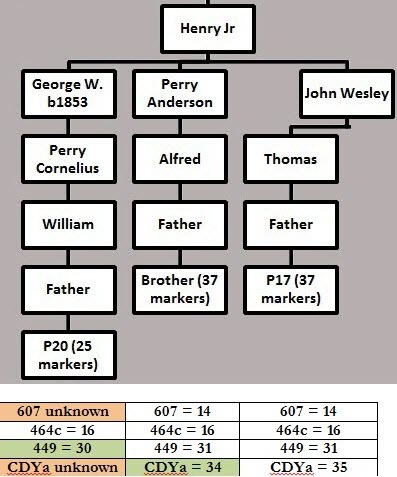 Some genealogists like Excel charting. If you do, you might be interested in the McGuire charting method. 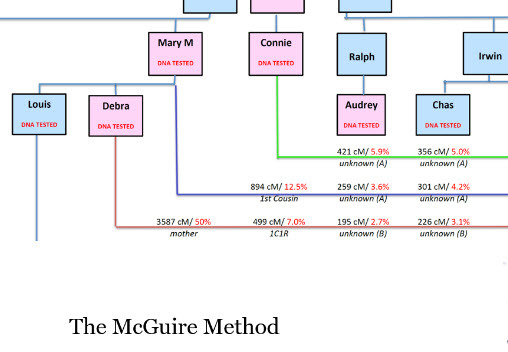 See http://thegeneticgenealogist.com/2017/03/19/guest-post-the-mcguire-method-simplified-visual-dna-comparisons/. I find Excel's drawing tools more difficult to use than Word, and even Word is not intuitive or easy. There are many online help sites with info on how to use Microsoft Smart Art. When I want to do something new I usually just try Google and can generally find step-by-step instructions. Debbie Parker Wayne, "One DNA Analysis Chart Process," Deb's Delvings, 30 June 2017, updated 13 July 2017 (http://debsdelvings.blogspot.com/ : accessed [date]). National DNA Day is coming soon—25 April. Sales on DNA kits have already started! Updates added 21 April 2017. Family Tree DNA (FTDNA) starts their sale on April 20, ending at 11:59 p.m. Central Time on Thursday, 27 April. Upgrades on prior Y-DNA and mtDNA tests are not included. Adding a new test to an existing kit will receive the discounted sale price. See all of the current sale prices on this product page once the sale starts. To add a test to an existing kit, login to the account first. To order a new kit for someone without an account, just click on the price button on the product page and follow the instructions on the screen. If you are attending the New England Regional Genealogical Consortium conference at MassMutual Center in Springfield, Massachusetts on 26-29 April, the FTDNA crew will be in attendance. Kits can be purchased at special event prices at the conference until the Exhibit Hall closes on Saturday. The Exhibit Hall will be open to the public at no charge 9:00 a.m. to 5:00 p.m. local time on Thursday; 9:00 a.m. to 5:00 p.m. on Friday; 9:00 a.m. to 4:00 p.m. on Saturday. AncestryDNA is offering 20% off—sale price is $79 for the autosomal DNA test. Be aware that if you do not pay a subscripton fee to Ancestry you do not have access to all features (see https://support.ancestry.com/s/article/ka215000000TzydAAC/Accounts-after-Cancellation). 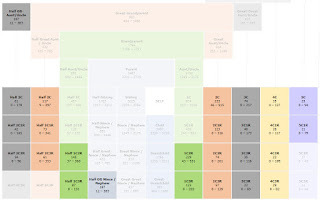 When viewed on 21 April 2017, this page indicates that with a guest account you can see ethnicity estimates, DNA matches, Genetic Communities, automatic updates to your ethnicity estimate as updates are released, shared matches, and you can contact matches; you do not have access to New Ancestry Discoveries, DNA Circles, Shared Ancestor Hints, viewing your matches’ trees, or lists of surnames and birth locations that appear both your tree and your matches’ trees. MyHeritage is offering autosomal DNA tests for $79. LivingDNA is offering $40 off their test for a sale price of $119. LivingDNA's test is different than what we have been using for DNA and there is no match list (so far). See Roberta Estes' blog post describing her LivingDNA test results for more info. 23andMe has no special listed on their website as of 21 April 2017, 4:30 p.m. CDT. Have fun analyzing the shared DNA segments and determining how you are related to all of your DNA matches! If you need to learn more about how to analyze your DNA matches check out our genetic genealogy workbook Genetic Genealogy in Practice, co-written by me and Blaine T. Bettinger. 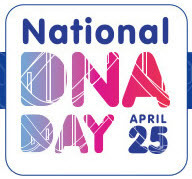 To cite this blog post: Debbie Parker Wayne, "National DNA Day Sales 2017," Deb's Delvings, 19 April 2017 (http://debsdelvings.blogspot.com/ : accessed [date]). Note: All images are screenshots captured by Debbie Parker Wayne. Where names of living people are include, permission was obtained. Be aware: Genetic Communities is clearly marked as a "beta" resource. It will change over time and changes have already been seen in the community makeup, names, and assignments since the rollout. 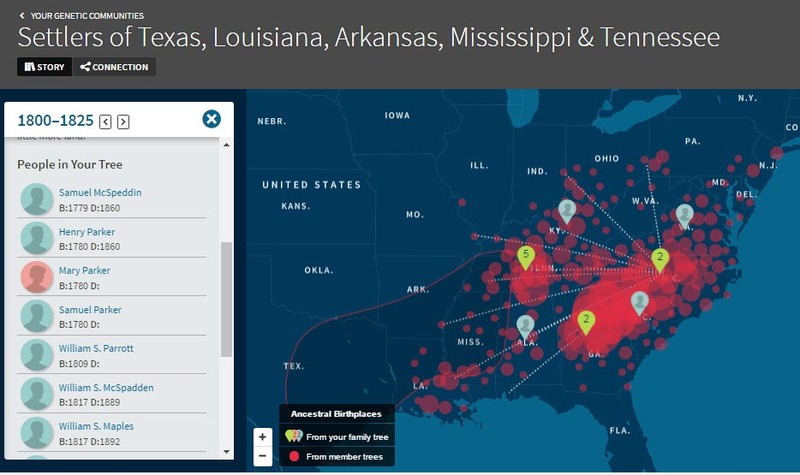 This week AncestryDNA unveiled a new tool for DNA test-takers—Genetic Communities. This tool may clear up some of the widespread misunderstanding of admixture prediction. Admixture predictions are based on where our ancestors may have been thousands of years ago—a period for which few genealogists have documentary evidence. Genetic communities are where our ancestors were within two hundred years (more or less)—a period for which most genealogists have documentary evidence. Quick! Take advantage of the chance to learn about Genetic Communities for free through until 6 April 2017 by viewing this informative webinar recording. There is a fee to view after that date. 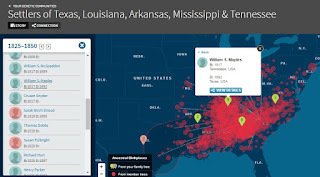 Blaine T. Bettinger, "Exploring AncestryDNA's New Genetic Communities," webinars, Legacy Family Tree (http://familytreewebinars.com/download.php?webinar_id=618). This prediction is based on the birth states of my ancestors shown in the chart below. A Facebook friend started a meme a year or so ago. He had us creating four to six generation pedigree charts listing only the birthplaces of ancestors and color-coding the blocks. 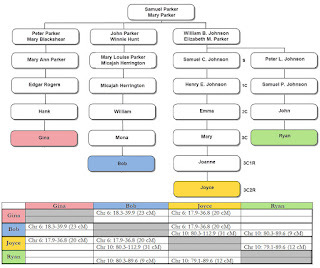 Here is the chart I posted last year (I have filled in a few of the question marks since then with ancestor names). It shows all of my ancestors born in the South back to the early 1800s. Earlier generations are not shown here, but they are in the southern United States as far back as I have traced each line. I have one lone fourth-great-grandfather who was supposedly born in New York in about 1800 and was in Mississippi by 1810 to 1820. My GCs are exactly what I predicted. The names assigned by Ancestry are not Upper South and Lower South. The expected Southern states are included in the GCs which have been given more descriptive names by AncestryDNA. So how do these GCs help me with my genealogical research? For me, I get few new clues as to locations of ancestors after the late 1700s. Someone with a less extensive tree may get clues as to which states their ancestors came from. Clicking the Connections button, I do get some clues as to potential European origins of most settlers in the areas where my ancestors settled in the New World. These clues agree with the family stories that have been passed down of ancestral origins in Germany, England, Scotland, and Ireland. I see a list of surnames that are found more often in this GC than outside of it. 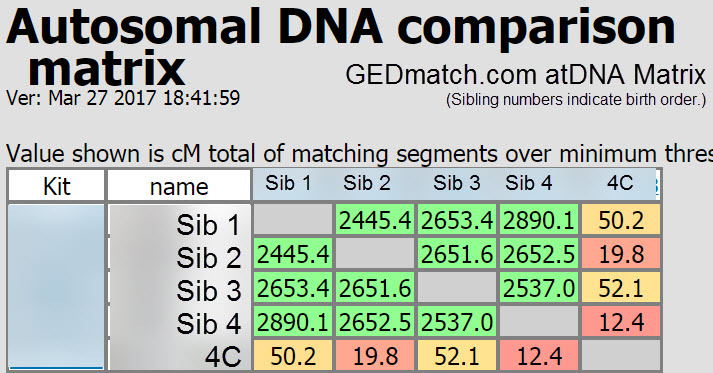 I can use the "View All Matches" button to see which of my DNA matches are also part of this GC. This match list contains only DNA matches who are also part of this GC. A match with a shallow tree may be able to get some clues from the ancestors in my tree that are in this GC. Back on the window with the GC Stories, if I click on one Year Span in the community story bar I can see which of my ancestors were in this community during that time span. I can use the left and right arrow keys next to the year span to cycle through all year spans. I can zoom the map in to see finer detail. I can click on a "pin" on the map to see which ancestors are associated with this pin. It is helpful to see which of my ancestral lines were in the same or nearby counties at the same time. This is a great by-product of the GC maps. Before now, I had to use other tools to map where my ancestors were at any given time. For details on the science behind Genetic Communities and how others have used GCs see these resources. Eunjung Han, et al., "Clustering of 770,000 genomes reveals post-colonial population structure of North America," Nature Communications 8, Article number: 14238 (2017) doi:10.1038/ncomms14238 (http://www.nature.com/articles/ncomms14238). Catherine A. Ball, et al., "Genetic Communities™ White Paper: Predicting fine-scale ancestral origins from the genetic sharing patterns among millions of individuals," Ancestry (https://www.ancestry.com/cs/dna-help/communities/whitepaper). 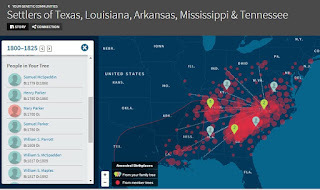 Blaine Bettinger, "AncestryDNA’s Genetic Communities are Finally Here!," The Genetic Genealogist, 28 March 2017 (http://thegeneticgenealogist.com/2017/03/28/ancestrydnas-genetic-communities-are-finally-here/). Leah LaPerle Larkin, "Genetic Communities Are Here!," The DNA Geek, 27 March 2017 (http://thednageek.com/genetic-communities-are-here/). Leah LaPerle Larkin, "The Science Behind Genetic Communities at AncestryDNA," The DNA Geek, 3 March 2017 (http://thednageek.com/the-science-behind-genetic-communities-at-ancestrydna/). Roberta Estes, "More About Genetic Communities and Display Problem Hints," DNAeXplained – Genetic Genealogy blog, 28 March 2017 (https://dna-explained.com/2017/03/28/more-about-genetic-communities-and-display-problem-hints/). To cite this blog post: Debbie Parker Wayne, "AncestryDNA Genetic Communities," Deb's Delvings, 1 April 2017 (http://debsdelvings.blogspot.com/ : accessed [date]). Programmers who are interested in genetic genealogy have provided some great tools for DNA analysis. Testing companies provide some great tools, too. New tools are produced all of the time and I use and love most of them. I WANT MORE. I want some specific features. Few of these tools today correlate the detailed DNA data (Y-DNA STR mutations, atDNA shared segments with start and stop points on a chromosome) with the family tree in an easily understood way. That correlation is essential for the "genealogy" in genetic genealogy. One of the to-do tasks that keeps getting shoved lower on my priority list is to provide genealogy software developers with a list of what we need to incorporate DNA data into our databases and to create useful output for analysis. Genetic genealogical research has matured to the point where this should become a priority. If we all pool our ideas, we can come up with a good list to provide to developers so the output is what we want. We need a list of the data we want to store in the genealogy database as well as what type of output reports we need. So what would your ideal genealogy database incorporate and provide as output for your genetic analysis? Not necessarily the raw DNA data for analysis, but the shared DNA data related to the other test-takers in your database. Feel free to provide suggestions as comments to this blog post, as Facebook comments if you read this on Facebook, or contact me directly using the email addresses on my website http://debbiewayne.com/ (scroll to the bottom of any page to see contact info). So what finally spurred me to make this a priority after all this time? (1) I investigated different tree creation tools a few months ago and discussed it on Facebook. I found none of the tools produce exactly what I want for DNA analysis. (2) The McGuire Method of charting several of us saw last summer was published. 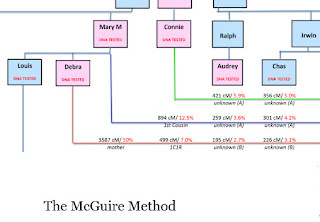 Lauren McGuire recently wrote a guest post on Blaine T. Bettinger's The Genetic Genealogist blog, "GUEST POST: The McGuire Method – Simplified Visual DNA Comparisons." This describes the great chart she designed for correlating a family tree and shared autosomal DNA (atDNA) totals for analysis. 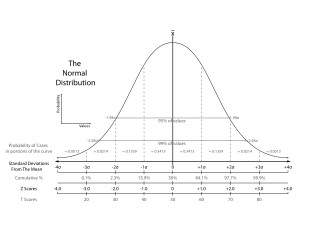 The chart Lauren uses in the blog post displays total shared centimorgans (cM), percentage shared, and relationship of each person on the tree in an efficient and compact format. I like seeing all of these items at once as all are important during analysis. I immediately loved Lauren's chart when I first saw it. She and I obviously think the same way about what we want to see when analyzing DNA information. My own charts started out with printed trees - either created in an image editor, Microsoft Word SmartArt, RootsMagic genealogy software, Progeny Charting Companion, or, more recently TreeDraw. Lauren and many others use Excel. Some use LucidChart and other online charting tools (find more info on these tools with a Google search). None of these tools provide an easy way to create a tree that only includes the DNA test-takers, much less incorporate the DNA data with the tree. And often my DNA data is handwritten at the bottom of the printed chart. 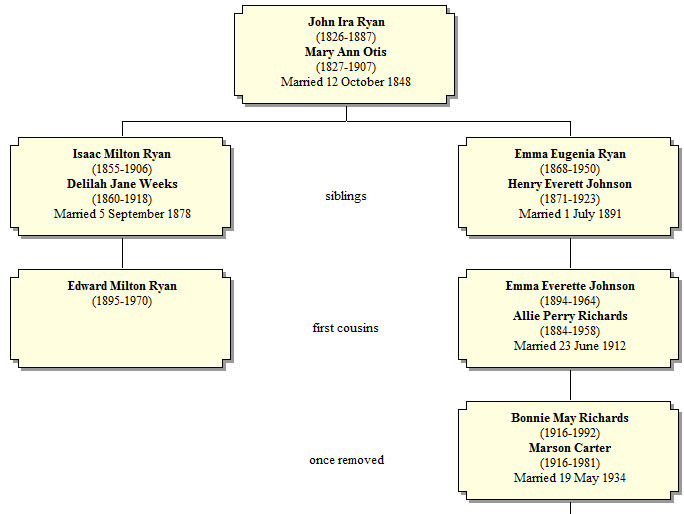 If I want to make it look prettier then I spend a lot of time getting a Word table to line up under the family tree. I use a similar table when I am analyzing total shared DNA against the tree relationships. What other formats have you found useful? What would make your DNA analysis process easier? In my opinion, tree charts are most useful when each test-taker's lineage is shown in a column and each generation is contained in a row. 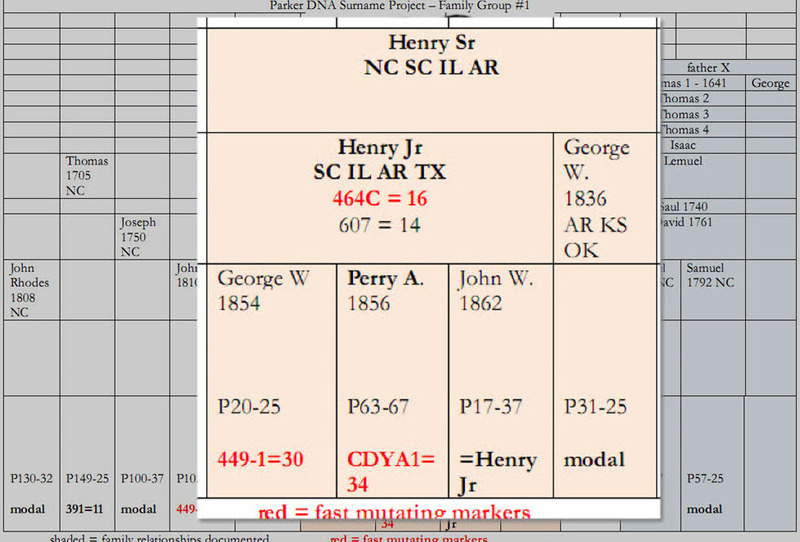 The DNA data for a test-taker can be shown below in the same column as the lineage. The rows allow for easy calculation of relationships - which the software could do for us and include in the chart. A chart including only the people in the DNA study is essential. I have been creating additional RootsMagic databases including only the DNA test-takers and their ancestors, but this takes a lot of time. 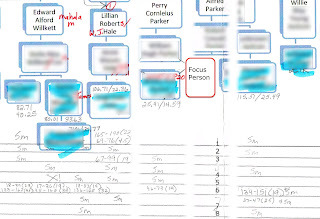 The pared down database is input to one of the charting programs, but I still sometimes have to remove spouse boxes when I am only interested in the men for a Y-DNA study, for example. Creating a chart from my full database and then deleting the people I do not want takes even longer. The DNA data to incorporate into our genealogy database varies for Y-DNA, autosomal and X-DNA, and mitochondrial DNA. 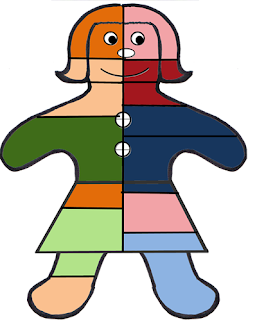 Autosomal DNA analysis requires total shared DNA or shared segment information. Y-DNA analysis requires notation of differing Y-DNA STR and SNP markers. Mitochondrial DNA requires listing the locations that differ from a reference sequence and/or between test-takers. For Y-DNA and mtDNA we may want to include haplogroups. Even though we all know the admixture estimates vary depending on the reference population and algorithm used, we might want to record the estimates and which portions of which chromosomes match which reference populations. March 21: Added a cropped portion of the McGuire chart with permission of creator, Lauren McGuire. 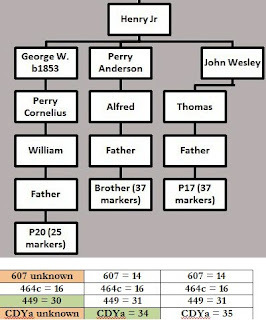 To cite this blog post: Debbie Parker Wayne, "Wanted: Genetic Genealogy Analysis Tools Incorporating Family Tree Charts," Deb's Delvings, 21 March 2017 (http://debsdelvings.blogspot.com/ : accessed [date]).